They say keep your friends close and your enemies closer, but you prefer to keep your weapons closer still. While your trusty sword and shield have served you in countless battles, you believe in always having a backup. 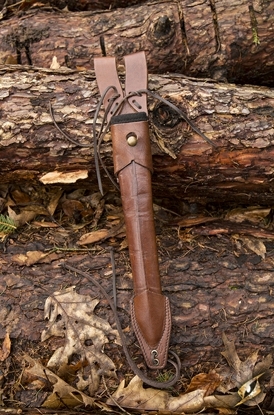 Your dagger, encased in a Dagger Scabbard, always hangs at your belt. It waits to be used in that desperate moment where an enemy is above, your sword is on the ground, and you don’t have time to reach it. It’s not happened to you yet, but you’ve seen the scene played out on the battlefield before and you will not be caught unawares. 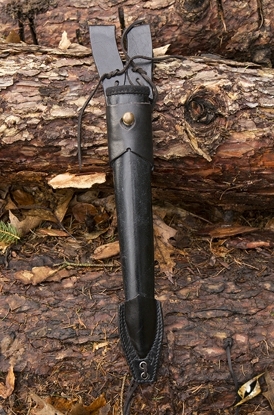 Related links to "Dagger Scabbard"
Customer evaluation for "Dagger Scabbard"